The artwork is complete save for a trip to the framers. Wondering what this is about? Click here to find out more about this project. I have glued most of the images and textures onto the artwork although I will add a few at the end if required. The next stage was to add the text. For the heading I used my letterpress wood type and after a little practice, I tackled the real thing praying I wouldn’t make a spelling mistake. I used coloured ink and allowed the colours to blend, keeping a palette of blues, greys and lilac and I will live with the slightly wobbly letters. For the main body of text I considered using a computer font and rubbing it on using artists’ thinners. In the end with encouragement from Lin Kerr, I bit the bullet and wrote in my own ‘fair’ hand. I took the view that this isn’t a computer generated image and what seems like imperfection provides the character. Wondering what this is about? Click here to find out more about this project. I have printed the photographic images onto Chinese rice paper using a laser printer – and almost destroying my printer as the rice paper is soft and not designed to be fed through it. 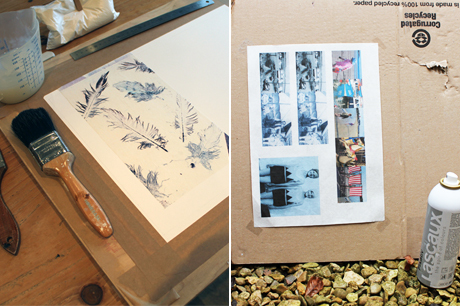 So that the ink won’t dissolve when glue is applied, the images need to be fixed by spraying layers of Lascaux. I started gluing layers onto the base paper working very calmly and slowly when no children were around. As soon as you apply glue to the paper it becomes like wet tissue paper, is very difficult to handle and almost impossible to reposition, so learn to love the odd crease. I found that photographic images can’t be realigned at all because the ink starts to seep through even though I used fixative. I worked slowly but as efficiently as possible and then put it aside to dry. Wondering what this is about? Click here to find out more about this project. 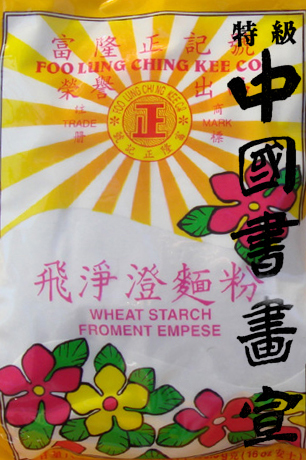 A cheerful bag of wheat starch, I love its packaging. Making glue! It feels gloriously archaic, a bit like Jane Austen making her own ink before writing. To stick layers of paper, you need wheat starch glue because it imbues right into the surface of the paper, making the new layer an intrinsic part of the base paper. Wheat starch is bought from Oriental grocery stores and the glue is made using water, the white powdery starch and cooking it on a stove. It requires much stirring and whisking as lumps will return to haunt you! Practice makes it a simple task and as the glue only lasts five days that is just as well. Wondering what this is all about? Click here to find out more about this project. Hard to make this picture exciting but at least you can see what 'stretched paper' is! I am starting preparations for my artwork which include stretching paper and making glue. Paper is stretched so that when it is worked on, it won’t buckle – like the precious love gifts painted by children. 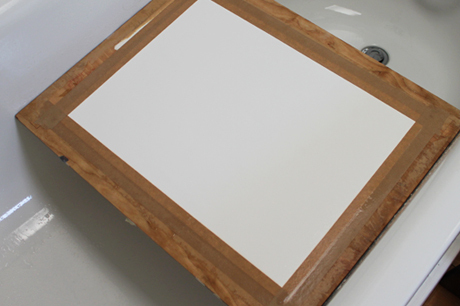 You wet the paper completely, lay in on a plywood board and glue it along the edges with gum tape so as it dries it can’t buckle and becomes a stable surface to work on. I haven’t stretched paper for many years and used to do it with my eyes closed BUT it didn’t work this time. I could cry, I have so little time to do art and now the most basic preparations weren’t working. What was wrong? I discovered that gum paper is now so flimsy that the glue dissolves too easily. I had to ensure that the paper was wet but blot it with a towel so it was not too wet and the gum paper could only be lightly dampened but still had to be wet enough to stick. I kept checking my paper as it dried and on the third attempt all was well. It appears that even stretching paper is an art form… bring back the old gum tape. Wondering what this is all about? Click here to find out more about this project. Time to stop conceptualising and start designing. To create original art works, I use a combination of designing on the computer to create a rough composition but nothing beats printing out the components and playing with them on a sheet of paper. I will make use of monoprint textures of nets and feathers. Feathers create a delicate texture and are also reminiscent of the flotsam and jetsam found on the beach. Rope and net-making was one of the chief industries of Bridport and in fact my grandmother’s first job was in Gundry’s office at the age of 14. Gundry still supply ropes, nets and twine and are still based in Bridport. 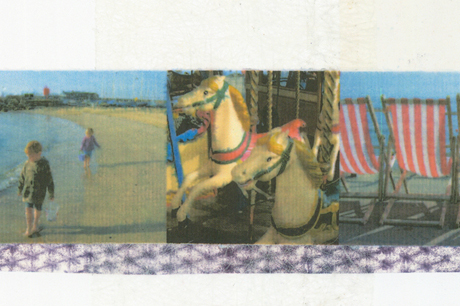 I am also using holiday photos (then and now) printed onto Chinese rice paper which softens and dissolves the image. 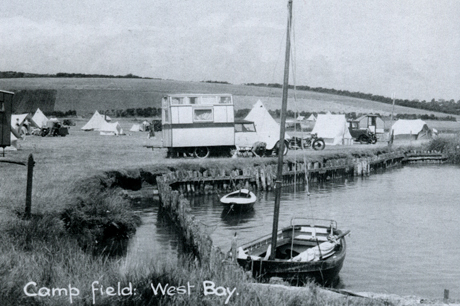 To find out more about holidays in the 1920s I read a book called ‘Just a line from West Bay’ which is a collection of post cards of West Bay. I learnt that a Fishermen’s Regatta had been revived in 1922 which provided entertainment with its booths and trade stands. There were water polo matches and it was quite normal to swim in the harbour, in fact part of it was enclosed for a swimming club. There would have been musical concerts and visits to tea rooms but I know that my granny’s family most likely enjoyed picnics and walks. The children would do much the same things as we do today – paddle in the water, catch crabs, make sand castles, bury their feet in the sand and collect pebbles. Did they whine a little if they were chilly? I understand that my great-grandmother was a battle-axe so probably not! I wanted to use photos from the book and after contacting the author, I realised that he was one of the experts on The Antique Road Show – Paul Atterbury. I really appreciated his prompt email saying that it would be fine to use the images and did I know he had also written a large coffee table book called ‘On Holiday’? I immediately ordered it and am soaking in its nostalgic images. Researching for this art project has enriched the experience while liaising with Paul Atterbury added to the adventure as I learnt about holidays of yesterday. Wondering what this is all about? Click here to find out more about this project. My grandmother on holiday with her parents and two older sisters. A few years ago my grandmother shared happy memories about her childhood holidays and how much joy they had given her. I was taken aback and shocked at her experiences compared to what we expect of holidays today. 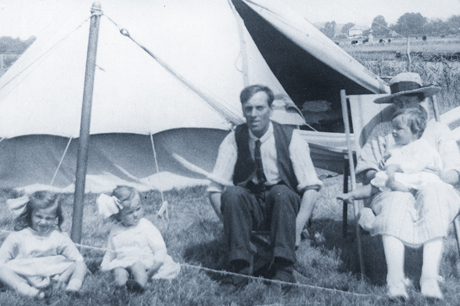 Granny Mom lived in Bridport and their much-anticipated annual family holiday was in West Bay a mere 1½ miles away. Holidays are now so complicated and we travel long distances with high expectations. We owe our family and ourselves two or three holidays a year and at least one should be overseas. 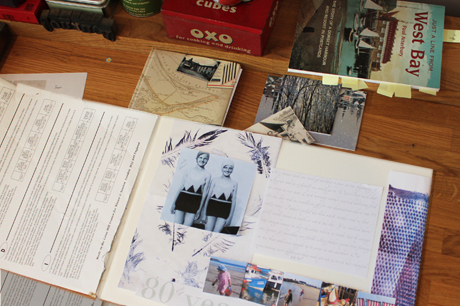 I want to create an art piece that records my grandmother’s holiday memories of the 1920s and I hope with a gentle prod help us rethink our own expectations. It will also be a reminder of happy beach holidays in childhood when simpler things gave great satisfaction. 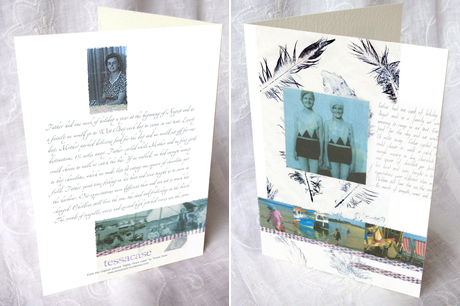 Originally the artwork was meant to emphasise the contrast of holidays 80 years apart but as I started researching, I realised that some things don’t change – children still love the sun, the sand and messing about on the beach. 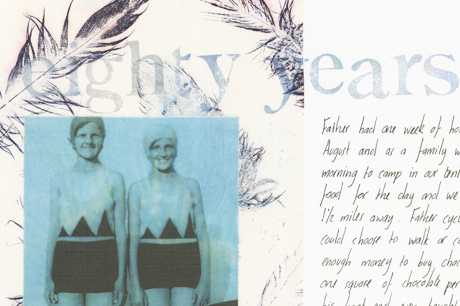 The sounds of seagulls, waves and excited high-pitched voices are still the same. 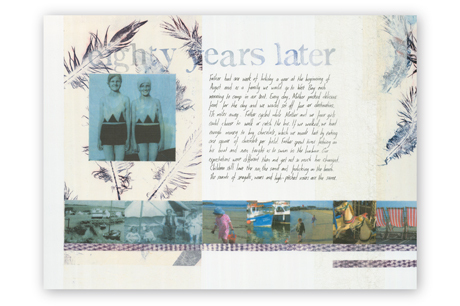 I will work with layering techniques similar to this piece ‘Memories’ which was also inspired by my grandmother.